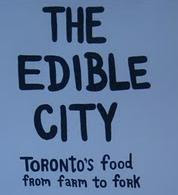 We're onto the next course as we munch our way through "The Edible City." Here's what the "Primo" section of the book brings us. Pamela Cuthbert kicks it off by asking readers to take stock of their kitchens - could you provide food for your family in an emergency? What if borders closed and the food supply was on lockdown? How would we hold up with our "delivered-just-in-time" grocery model? I agree that food security is one of those things we never think about until it presents itself as a pressing issue. Pamela outlines the importance of food security (especially among those less fortunate than us) and the work that is being done on an ongoing basis to try to keep it top-of-mind. As if a partial answer to Pamela's story before it, Lorraine Johnson writes about urban gardening past and present - she mentions Victory Gardens for the war effort / during the Depression where food security became something the entire country focused its attention on. She also mentions the potential the city has for urban gardening, making particular note of the uproar over planting fruit trees in Ben Nobleman Park across from Eglinton W. Subway Station. I think it's a neat idea - I'm planning to make a visit in the summer to see said fruit trees. Mary F. Williamson follows the history of the Webb family, who was well-known for their wedding cakes, their catering business, and their restaurants and bakeries. She paints a picture of lavish catered events of a bygone era, including a swanky party thrown in Toronto by the Earl and Countess of Aberdeen in celebration of Queen Victoria's Diamond Jubilee. The story even contains an old menu from one of the Webbs' catered events. Can't say I miss the aspic craze though - one of the items mentioned in the story is tongue in aspic (it's not the tongue that throws me off, it's the aspic part! I digress a bit here, but I had a Filipino dish with cow tongue at Christmas and thought it was pretty good - it's a lot softer than I figured it'd be). Katarina Gligorijevic explores "The Toronto" - a cocktail that, oddly enough, many Torontonians have never heard of and that has no traceable connection to Toronto whatsoever! David Alexander, executive director of the Toronto Vegetarian Association, gives a bit of insight into how far vegetarianism in Toronto has come from 1945 until now. I wasn't much into the story itself (it read like more of a promotion for the TVA) but I loved the Vegetarian Food Fair at Harbourfront last year and plan to go back again this year - despite not being a vegetarian, there was some great food there. The former chef at The Stop Community Food Centre, Joshna Maharaj, explains the political and social power chefs can have while stressing the fact that affordable, yummy and healthy food should be accessible to all; having a trained chef in The Stop's kitchen really gets that message across. Jamie Bradburn talks about bread bakeries in Toronto. I love the images of bread advertisements from 1900. Liz Clayton talks about the specialty coffee scene in Toronto, and asks whether it's anti-nationalist to skip over Canadian icon Tim Horton's in favour of your local neighbourhood coffee bar. Erik Rutherford talks to the city's top French chefs to find out what they think of their customers here in Toronto - are they too picky? Too quick to fall for fads? Do they properly appreciate the art of French cuisine? Karen Hines colourfully recalls the days where food safety (and germophobia) wasn't nearly as much of a concern through her entertaining tale of her "filthy hand." Stay tuned for more from The Edible City! Click here to read our reviews of the other (antipasti, secondo, contorno, and dolce) of the book!